I love a good mystery, and a good mystery set in the past is even better. So I was delighted to encounter Sugarland, the latest novel by Martha Conway (after 12 Bliss Street and Thieving Forest, both of which we discuss, if not at length), in preparation for my latest New Books in Historical Fiction interview. As you can see from the description below, Sugarland takes place in Chicago right after the Great War—a city still racially and economically segregated despite the influx of Southerners fleeing the influence of Jim Crow laws. In this land of liquor, nightclubs, and crime, a complicated scheme begins to unravel, a young man dies, and two women whose paths might otherwise never cross must work together to figure out what’s happening in time to save themselves and those they love. It’s a wonderfully rich story, and Conway is an engaging speaker, so give it a listen—then read her book. It’s definitely a hidden gem. It’s 1921, and Prohibition is in full swing, but you wouldn’t know it from the nightclubs and speakeasies of Chicago, where bathtub gin mingles with homemade bourbon distilled from trainloads of corn sugar shipped from Southern farms. 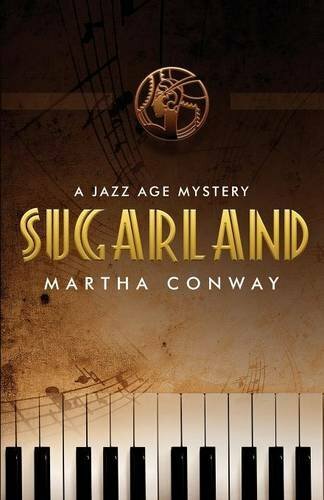 A young man named Al Capone is on his way up, the bar owners squabble over control of the sugar trade, and the police know to turn a blind eye. So when a drive-by shooting ends in murder, two young women—Eve, a black jazz pianist, and Lena, a white nurse—band together to find Eve’s missing stepsister and the killer of Lena’s brother in Sugarland (Noontime Books, 2016)—a fast-paced, twisty, riveting journey through the seedy back alleys of the Windy City, where the Great Migration has only just begun to break down the barriers of racial segregation. Out of these disparate elements Martha Conway—the winner of numerous awards for her previous historical novel, Thieving Forest—blends a scintillating cocktail set to the thumping rhythms of jazz, directed by a mysterious kingpin known only as the Walnut. I've read many stories set in the 1920s (I even write them), but this sounds one of the best I've heard of.